HOTERY PRODUCTS CORP. is the leading Taiwan manufacturer, supplier and exporter of Portable Welding Torch which are formulated to suit individuals' personal needs. Our range is available in high quantities and at most competitive pricing. We are also capable to offer our entire range as per the requirements of our customers. Our produce is available at very reasonable prices. If you are interested in any styles of our products, please feel free to contact us. 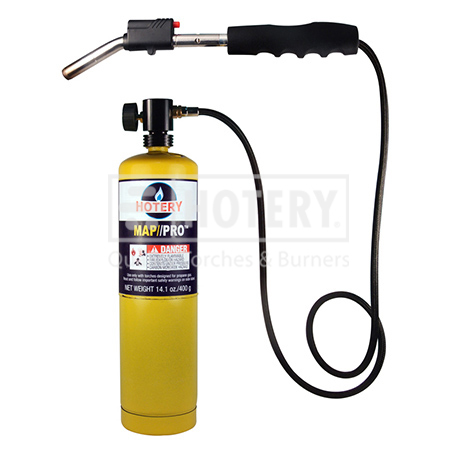 Product description: Auto-ignite hand torch with hose. 1. Instant on/off trigger igniter for simple one-handed operation. 2. Stainless steel Burner Tip for durability. 3. Ideal for all types of soldering and brazing projects. 4. Wire clip is equipped to attach onto a cylinder for easy operation. 5. Fuel suggestion: with map/pro. 6. Flame type: Concentrative flame. that are used for a variety of industries. Thats are offered to our clients in standard as well as customized specifications.